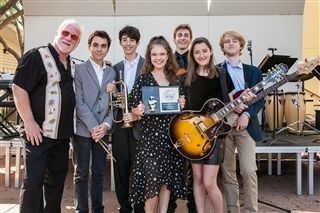 On Saturday, April 21, Windward’s Advanced Jazz Ensemble won First Place in their division at the Fullerton Jazz Festival, scoring a near perfect score of 287/300! The six member ensemble was comprised of Jack Antholis ’19 on drums, Brody Bishop ’19 on the flugelhorn/percussion, Jackson Jones ’18 on violin/vocals, Will Landgraf ’19 on bass/guitar, Valentina Shelton ’18 on vocals/piano, and Samantha Spector ’19 on guitar/bass/vocal. This is the first time in the School’s history that a Windward Advanced Jazz Ensemble has won first place honors. Congratulations to this great group!